Montague Row closed for around three hours yesterday after debris fell from the roof of a property. Police in Inverness closed a city street yesterday after debris fell from the roof of a property. Montague Row was closed to motorists for several hours following concerns for the condition of an unstable chimney stack in the area. Two fire appliances were dispatched to the scene alongside police shortly after 11am to put a cordon into place. One local resident said: “I heard the fire engines and the turntables operating. There seems to be a crack in the chimney stack. They had to cordon it off because they have to decide what to do, either take it down or repair it. The section of footpath, outside The Bakery, has now been closed off to pedestrians by metal fences as work begins to determine the scale of the damage. 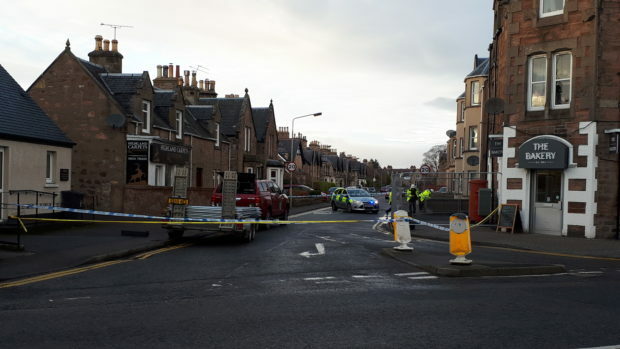 A spokeswoman said: “The Highland Council can confirm that the footpath around The Bakery on Montague Row in Inverness is closed to pedestrians following an incident of falling debris earlier today.